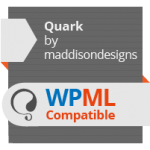 Have you found Quark useful? Have you used it in a recent project? How 'bout you drop me a quick email and let me know. I'd love to see what you've done with it. If you’re having any issues with using this theme or just need to ask a question, you can post a question on the official WordPress support forum and I’ll do my very best to help you out.